Ewald Balser had engagements in Basel and Düsseldorf before he debuted at the Burgtheater in Vienna as Faust in 1928. He played many more parts in Vienna and made guest appearances in Berlin, Munich and at the Salzburger Festspiele. He also appeared in movies. In 1963 Balser became honourary member of the Burgtheater. He received the Grillparzer-Ring in 1967 and the Kainz-Medaille in 1968. He was married to the actress Vera Eberle (1897-1982). 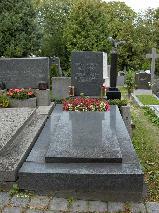 The grave of Ewald Balser at the Neustift am Walde Friedhof, Vienna.